The key to life is dancing your way through it. Pensacola’s only country bar, Wild Greg’s Saloon is the perfect place to kick up your boots. I hadn’t line danced in ages, but the instructors at Wild Greg’s make you feel like a natural. They offer line dancing classes weekly, as you learn, step-by-step, some popular and new line-dancing choreography. Don’t worry about running out of room because you’ll be learning on the biggest dance floor in the area! If you’re already a country line dancing pro, get ready to show off your dance moves to today’s hottest country songs, all night long. Watch out for that mechanical bull in the corner, somehow throughout the night he whispers that he wants to try a little two-stepping with you, too. If you’re looking for something a little more traditional, you’ve come to the right place. Learn how to formally dance while visiting Pensacola at the Fred Astaire Dance Studio. Ballroom dancing has burst with popularity since “Dancing with the Stars” first aired on TV, and it’s easy to learn how to dance like a star with owners and top dance instructors Victor Luna and Dawn Westberry. The team at Fred Astaire Dance Studio makes it easy to learn the foxtrot, tango, cha-cha, salsa, jive and waltz, in a group or private lessons. You never know what type of dancing you’ll find or partake in at the Flora-Bama, but that’s part of the fun. 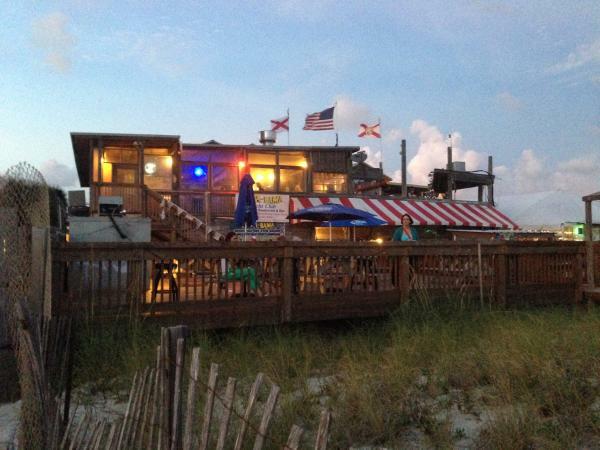 Flora-Bama is known as America’s “Last Great Roadhouse.” Heck, Kenny Chesney even wrote a song about it: “Sittin’ here at the Flora-Bama bout to open up a can of good times, unwind.” The dance floors are always filled with people getting their groove on – with or without shoes. It’s a beach bar and anything goes! The Bama Dome dance floor allows you to watch others dance from the floor level or second story. This little honky-tonk is sure to provide you a space to let out your best possible dance moves with an interactive audience! Are you ready to jump, jive and wail the night away? Pensacola Swing is one of the most active dance clubs in the Pensacola area. Bust out that old zoot suit and best swing dress to dance the night away at the American Legion Hall Post 33. Pensacola Swing offers free swing dancing lessons every Friday night during their weekly Swing Night. You don’t even need a partner to dance. You’ll be learning dance moves along with many others and watching the experts show off their best swing moves. 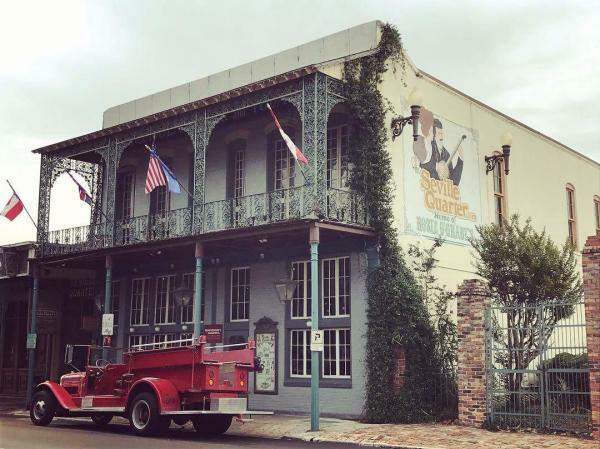 Known as the Gulf Coast’s entertainment destination, Seville Quarter is a place not to miss to bust a move. Phineas Phogg’s, a two-story dance club, is the home of high-energy dance music mixed by one of the best DJs along the Gulf Coast, DJ Mr. Lao. Today’s hottest hits are played and you can dance on a high-rise stage to sick beats. The college night dance parties are on Thursday nights for those 18 and up. Break out your dancing shoes with these five not to miss dancing destinations. Proven to be a great form of exercise, relaxation and fun, enjoy all types of dance in Pensacola. Have a favorite left off the list? Tell us about it in the comments section below! Whitney Fike is a native to the Pensacola Bay Area. Adventuring new places are how her best days are spent. She can often be found enjoying the many treasures our beloved city holds. She loves listening to live music, enjoying delicious Gulf seafood, attending festivals and events and finding ways to give back. Recently her husband, Adam, (with a little help from Whitney) finished remodeling a 91-year-old home in East Hill. Now you’ll find them running through the streets of East Hill. Together, they are always outside enjoying the beautiful Florida weather by fishing in Pensacola Bay or the Gulf of Mexico, riding bikes, and now adding home renovations. When she’s not wandering the white beaches or streets of downtown Pensacola, Whitney works behind the scenes as a public relations, social media and communications professional. She even has a crafty side as she is a modern quilter and always looking for inspiration. Follow her journey on Instagram and Twitter at @sparkplugwhit.